I wasn't planning on making more cupcakes this week, but the tiny little cupcake tins I found at the store inspired me. I decided also to finally try the "madeira" recipe from my cake decorating book. It was simpler than most of the rest, and looked good and standard (though it turned out a little dry). In a large bowl, cream butter and sugar, then add eggs and beat together. Add vanilla. Combine remaining dry ingredients, and add, about one quarter at a time, to wet ingredients until combined. Stir in peanut butter until mixed. If making cakes, add batter to one 9"x13" pan, or two 8" or 9" round pans, and bake for 35-45 minutes, until done (cake is done when a toothpick or knife stuck in the thickest part comes out clean). 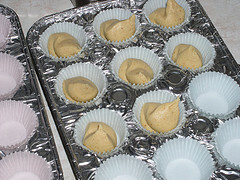 For cupcakes, fill papers 2/3rds full and bake 12-18 minutes, depending on size. Remove and let cool before frosting. In a large bowl, use electric mixer to combine sugar and cocoa powder until integrated. Add vanilla. If thicker frosting is desired, add more sugar; if thinner, add chocolate syrup or milk. Using a knife or pastry bag, apply frosting to top of cakes or cupcakes. I had 36 mini papers, and enough batter left over to make eight "regular" size cupcakes (each about 4x larger than the minis), so the total yield here is between 60 and 72 mini, or 15-18 regular sized cupcakes. Thoughts and Advice: I found the cupcakes very good, but a little dry. They weren't at all crumbly, but they didn't stick to the wrappers (paper or foil) and didn't have the moistness I was looking for. If I made them again, I might use oil instead of butter in the batter, or splash in some milk. I also found the thick batter very difficult to handle at first (It wouldn't drop in cleanly with a spoon), so on my girlfriend's advice, I made a makeshift pastry bag and that worked fantastically. 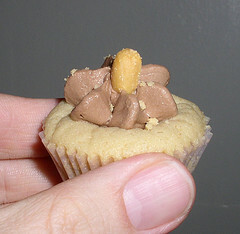 I garnished some of the cupcakes with crushed peanuts and/or a half peanut stuck in the frosting, and that looked nice and let people know what they were in for. If you make this recipe, I'd love to hear how it comes out! Those are sooo cute. Tiny little bites of awesome, I'm sure. Ok yeah, I would womp about 18 of those in a single sitting. So cute! This page contains a single entry by Michael Doss published on February 13, 2009 12:22 PM. Not every post has to be a long one was the previous entry in this blog. Thank you, Little Caesar's! is the next entry in this blog.